Peter Pichler Architects design for the new residential tower complex consists of approximately 260 apartments, parking garages, public facilities, gym and a running track on the roof. It is located in Maarssen, the Netherlands on a main axis between Amsterdam and Utrecht, and should act as a social engine in the area, which will undergo some major developments within the next years. 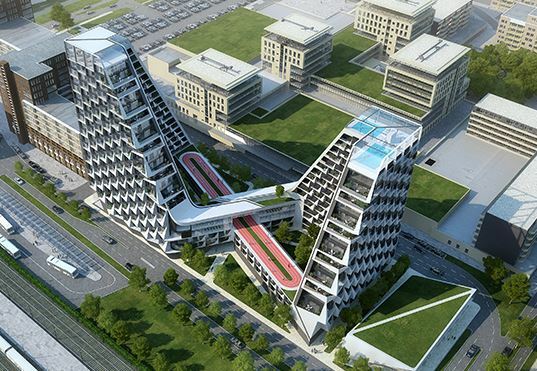 Milan based Peter Pichler Architecture‘s proposal for two looping towers is the result of an optimized geometry founded on views and sunlight. The starting point were the massing studies of straight extrusions that are moved towards the end of the plot to guarantee the view towards the river and the old city center of Maarssen from the offices set behind. The special situation of the site and the unsophisticated orientation of the apartments within a straight extruded tower with a central core led to a slim L-shaped geometry that guarantees multiple views and sunlight.